Sometimes a little still life is a good way to start the day. I always have trouble finding something "meaningful" to paint. So why not just something deliciously beautiful. And I thought the black background really enhanced the look of the garlic. And black is a serious colour and garlic is a serious food. Well that's how I see it anyway. 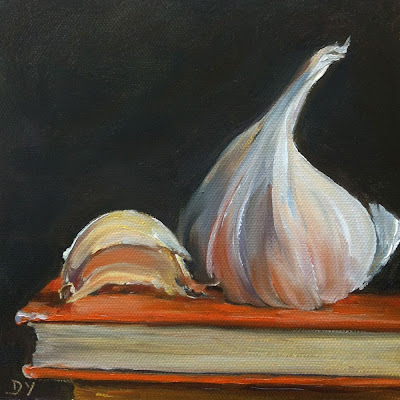 i did post a comment , however i suppose i must have posted it wrongly...anyways, i wanted you to know nevertheless that your book and garlic is simply extraordinary! i've been cheching for the book on aMAZON.